Kerry Neville is the author of Remember To Forget Me and Necessary Lies. In the year since my divorce, I've been visiting a plastic surgeon every month. Not for Botox, though maybe that would help the mid-forties creases across my forehead, nor for Latisse, which might assist me in batting longer eyelashes at potential romantic partners, but for tattoo removal. I sit in the cushioned lounger, wearing enormous orange-tinted goggles, the kind you might use for welding, and the doctor sits across from me on a stool, also goggled, wielding the light-beam laser. "I'm sorry," he says, "but this is going to hurt." He turns on the machine, and the light sparks against my skin in sharp pricks of pain. The laser moves slowly across the tattoo, raising an immediate, red, blistering welt. This hurts, more than getting the tattoo in the first place, but I am well-practiced in swallowing pain. Really, it's just a matter of breathing through it, telling myself that it will pass. When you're bipolar, when you've been decimated by an eating disorder and alcoholism, when your arms are crisscrossed with scars from when you used to cut yourself, a little transitory pain is nothing at all. Which is not to say that removing the tattoo is any less painful than all of that. On my first visit, the doctor inspected my arm; my wrist to be precise. The old shame rose up because I was certain he was narrowing in on the scars. "Not the whole tattoo," I said. "Just my ex-husband's name. I want to keep my kids' names and the swallows." "You know," he said, and ran his thumb across my wrist, my ex's name in Greek letters, a band of stylized black ink, "I have two rules for tattoos. One: no tattoos on the neck. Stupid idea. And two: only tattoo blood relatives, or children, on your body. The rest you'll regret." That first time, on the drive home, I cried. My ex-husband's name was indecipherable, a red throbbing flame across my wrist. It looked as if I had cut myself again, something I hadn't done in years. The wound whispered to me in that old way: Hurt yourself. You deserve it. Even he stopped loving you. But what I really cried over was what I had already lost. I got the tattoo five years earlier, after my last residential treatment for my eating disorder and bipolar disorder. I'd been staring at my forearms, counting scars, ruminating on the years of impulsive damage, on the shiny straight-edge razors and the rusty ones filched from tool boxes, on broken glass pocketed from gutters, on kitchen scissors, sewing scissors, nail scissors, serrated knives, chef's knives, and at my most stupidly desperate? When I was in the ICU after a desperately, deliberate overdose, a nurse gave me a can of Diet Coke--metal flip-top intact. With every shower, every application of body cream, every decision to wear short sleeves or a bathing suit, I had to face what I'd done. What could I do that would change the way I saw those scars? What could I do that might give me pause in the next impulsive flash? What could I do that would remind me of what tied me to this world of love and joy and redemption? A tattoo. On my wrist, superimposed on the tangle of scars. Greek themed, since so much of our lives were tied to that country--engagement, pregnancy, infancies, depressions, recoveries, our four-square made one. Two swallows swooping at each other, an ancient archaeological painting from a site in Santorini. Swallows: the birds of spring, of new life, of hope. 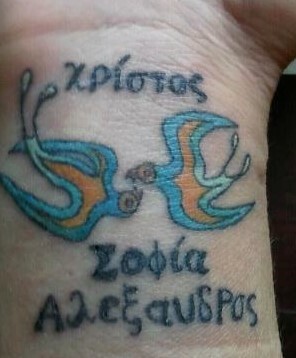 Surrounding the birds, the names of my family in Greek: The intended result? I could look at my arm and see meaning and purpose. Mad Mike, the tattoo artist, buzzed at my wrist with his needle. At one point, he stopped, and said, "You're awfully quiet. My clients tend to make a little more noise. They find it painful." I shrugged. "I do a lot of yoga." He laughed. "But you seem serene. But I guess I can see you are maybe used to pain here?" "That's what the tattoo is for. Hope. A reason to live." "I'm glad I can create that for you. Not my usual barbed wire or Celtic Knot." I surprised my family. My (ex-)husband loved it, and my daughter wanted to get a tattoo of her stuffed dragon. "You know what else that's cool about it?" she said. "It's beautiful and it covers up all those scars!" Divorce revises my understanding of the shared dream, the shared future, that four-square made one. What keeps me here has necessarily shifted. My children are still part of how I see my unfolding. But what I have discovered, is that while I was inscribing my family on my body, it was simultaneously breaking apart. My ex-husband told me he loved what I had done to myself (finally something that I'd done to myself that didn't inch me closer to death but towards life), but what he didn't tell me was that he was having an affair, and not invested at all in our shared future. I often wonder what he must have been feeling when he saw his name on my wrist, and knew that he was lying, or leading me to believe in a lie. And how maybe he couldn't tell me because my recovery indelibly depended on us. After a year of treatments, his name is almost gone. The light beam breaks down the ink and scatters the black particles throughout my body. They will always be there--floating microscopic memories of love and pain, of what can and can't be erased in the end.